Margie has been food gardening for 11 years in Ohio. I had an apartment with a deck for the first time ever and I knew that I wanted to embellish it with flowers. That was the initial start, but my grandma and my mom were/are amazing gardeners, so I have always wanted to get my hands in the dirt and see if I could do as well as they did. It makes me feel close to my family, just like crafting does. Also, if you grow food, you get the peculiar satisfaction of saying, “I am eating something I worked on.” That’s pretty cool. Pimiento pepper plants about to set fruit in Margie’s garden. 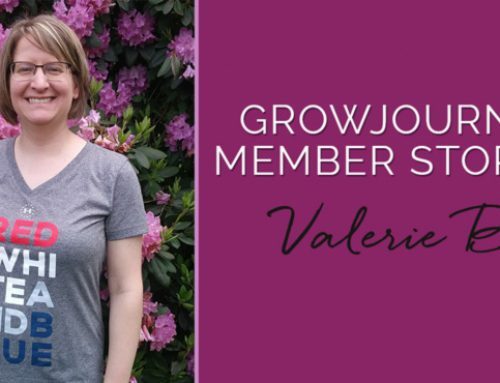 This past year – seeing full-fledged plants grow from seeds I planted. That’s a unique experience that I am not sure many people have these days. 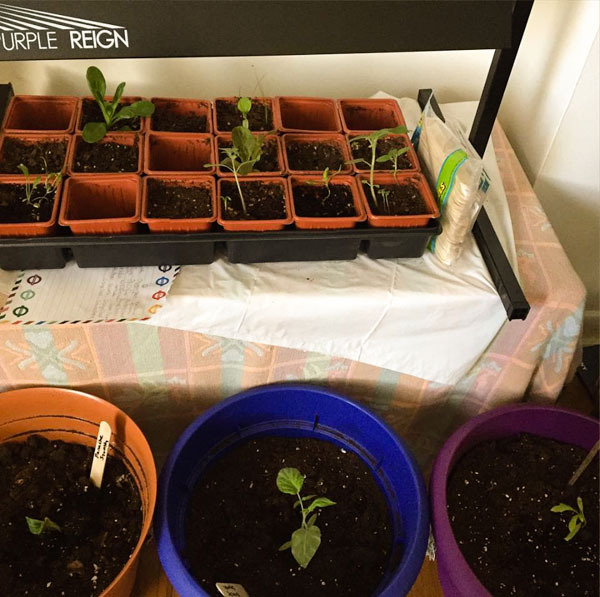 Margie’s young seedlings, all started from seed, before being transplanted out into her garden. Weather. There was an incredible drought this year and I wasn’t able to keep up with my watering. There’s so much I still don’t know. I guess I would say it’s interesting to see how much you don’t know about food. I never thought about what beets look like, I’d only ever bought them from the store. Right now I have cauliflower growing and I actually have no idea how that’s gonna evolve. Woah! Nice orange chard leaves, Margie! An interesting chard fact: chard and beets are basically the same plant, genetically speaking. They can even cross-pollinate with each other. Chard was bred more to produce edible leaves, whereas beets were grown to produce large edible roots. Young chard roots are edible, and beet greens are quite delicious and nutritious. Just one thing? 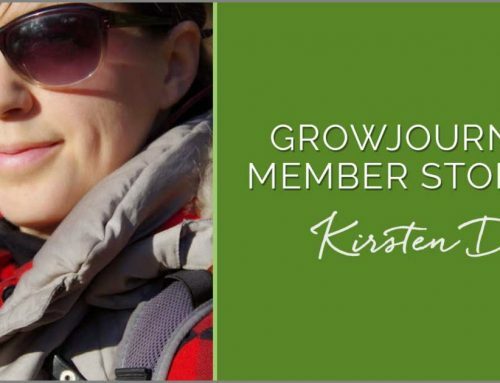 I love telling people about Grow Journey. I see their faces light up at the concept and that’s really fun. I like the diverse range of seeds I have to choose from. I like that my investment is virtually invisible but the results are nothing if not tangible. Different types of heirloom tomatoes growing in Margie’s garden. In the late spring, when it seemed like warm weather would never come, I thought back to my goal of trying to provide for myself as much as possible this year. My plan pretty much fell apart – I have no idea how to plan ahead, how to make room for different plants. But for one moment when it was cold and snowy and rainy, I thought, “My God, my not too distant ancestors would have been facing death if they had done this bad a job of providing for themselves. There weren’t grocery stores they could go to.” That was really humbling, and it has made me appreciate how readily food is available for me. This is Margie’s adorable dog, Cumbie, looking very concerned about whether Margie is going to be able to grow enough food to survive (and keep him well fed). Follow Margie on Instagram to see photos of her garden, adorable dog Cumbie, food adventures, and more. Make It Happen, Like Margie – Margie Clayman is inspirational to us and we hope she’s inspirational to you as well. Why? Because she’s getting it done. No excuses. She lives in an apartment, she’s quite petite, and she doesn’t have a lot of help (four furry paws don’t count). Any of those things could have been excuses for inaction, but Margie is brave enough to set goals and take action. Maybe her story will spur you to start your first garden, start making healthier meals, exercise, or make yourself better in some other way. We hope so. Thanks for sharing your story, Margie! Self-Sufficiency Is NOT The Aim – Margie makes a great point that we want to highlight further. We do NOT want to encourage people to try to be “self-sufficient.” That’s simply unattainable. We can’t make our own cars, build our own houses, sew our own clothes, or grow all of our own food. We’re actually made stronger and more independent by virtue of living in communities and building collaborative economies with other people. We want people to learn to grow organic food for all the benefits it confers to the gardener (psychological, physical, economic, etc. ); to make better holistic use of their lawns than simply growing turf grass; and to help preserve the world’s rapidly disappearing heirloom seed/plant varieties. Plus, as Margie says, there’s just an amazing, indescribable joy that comes from biting into a delicious fruit or veggie that you grew all the way from seed. Once you do that, you’re hooked for life! And you’ll also place more value on the quality of your food and how it was grown.